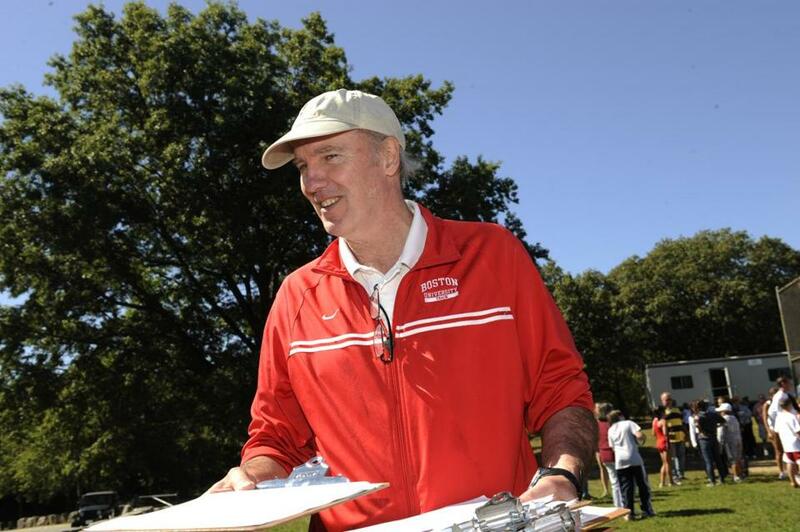 Mr. Lehane coached at Boston University for 35 years, guiding numerous cross-country and distance runners. At that moment “you gain a dimension of character that you can call on whenever you have to,” he added in his coach’s statement on a BU website. During 35 years at BU, Mr. Lehane coached scores of athletes to success, including 50 All-Americans, two NCAA Division I national champions, and two Olympians. Mr. Lehane, who will be inducted into BU’s Athletic Hall of Fame in November, died in his Roslindale home Sept. 23 of amyotrophic lateral sclerosis, which is known as Lou Gehrig’s disease. He was 68 and previously lived in Brookline for many years. A former assistant director of track and field at BU and distance coach for the indoor and outdoor track teams, Mr. Lehane guided the men’s cross-country team to 10 NCAA championship meets, and to its seventh New England title in 2015. His women’s cross-country teams won 17 America East Conference and two Patriot League titles. Mr. Lehane had coached at Austin Preparatory School in Reading and Sanford High School in Maine before being hired at BU in 1982. “He was a gentle, thoughtful, intellectual man who was so well respected within our athletic department,” said Sally Starr, BU’s field hockey coach. In February at BU’s Track and Tennis Center, with Mr. Lehane and his family in attendance, the university’s indoor invitational meet was renamed the Bruce Lehane Scarlet and White Invitational. While working with athletes, “you make a connection, and that connection never dissolves,” Mr. Lehane said in a BU video that is posted online. His work was “a partnership with the athlete. Coaching is only part of the formula, and there’s the athlete’s response,” he added. “I’m kind of basking in their achievements,” Mr. Lehane said of the accolades he received as a coach. Born in South Boston, Bruce Patrick Lehane was a son of Stephen Lehane and the former Harriet Wiley. While running for Boston English High School, Mr. Lehane broke the Class C 880-yard record in 1964 at the Boston Regimental championship at White Stadium. The Globe reported that his “tremendous kick” helped him nip a Boston Latin runner at the tape. At Boston State College, where he was a two-time All-American, he set program distance records on teams so talented they were called “Squires’ Flyers” in honor of their coach, Billy Squires. Mr. Lehane later coauthored the book “Speed With Endurance” with Squires. “We worked out together and ran all the relays together, and he was a perfectionist who always got the most out of himself and those around him,” said Lou Ruggiero, a former Boston State teammate and fellow All-American of Mr. Lehane’s who now coaches cross-country at Medford High School. Mr. Lehane graduated from Boston State in 1970 with a bachelor’s degree in English and secondary education, and received a master’s in reading and language from what is now the University of Massachusetts Lowell. He was inducted into the University of Massachusetts Boston Athletics Hall of Fame in 2013. In 1987, Mr. Lehane married Lesley Welch, an NCAA and Athletics Congress cross-country champion who had starred at Peabody Veterans Memorial High School and the University of Virginia with her twin sister, Lisa Welch Brady. When their coach at Virginia left for a different college, the sisters transferred as juniors to BU. Lesley, a three-time Globe cross-country girls’ high school runner of the year, focused on the road-racing circuit and became a professional runner after returning to Boston. She also has served as a track and cross-country coach at BU. “We were very much alike and shared a passion for running and reaching the highest level of fitness,” Lesley said of her husband. Their son Elliot of Roslindale was a cross-country and track athlete at BU, and was a Terriers assistant coach for two years alongside his father. In 1989, a letter Mr. Lehane sent to the city of Boston on behalf of area track coaches was crucial in maintaining the cross-country course in Franklin Park and improving safety. “It was a unique situation because Bruce was by nature a humble and quiet man. But he had a deep passion for running in Boston, and it inspired him to take that leadership role,” said Fred Treseler, coach of the Emerging Elites running program, who was on a committee with Mr. Lehane that mediated the Franklin Park issues. In addition to Lesley and Elliot, Mr. Lehane leaves his sons Blaize of Los Angeles and Aidan of Roslindale; and a sister, Lori Nalbandian of Hingham. A prayer service will be held at 5 p.m. Sept. 30 in the Robert J. Lawler & Crosby Funeral Home in West Roxbury. A memorial service will be held at 6 p.m. Nov. 1 in BU’s Marsh Chapel.